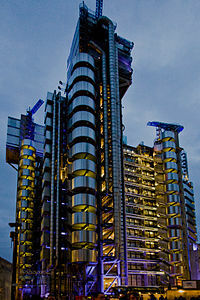 The reports – started by The Sunday Times – suggesting that Lloyd’s of London might be on the move from its iconic Richard Rogers’ building on the corner of Lime Street and Leadenhall Street will provoke mixed feelings for many in the insurance industry. There are still many who have never come to terms with its modernity and would happily bid it goodbye but they are unlikely to be any more comfortable in the rumoured alternative of a move to a planned 36-story development further down Leadenhall Street. This has been provisionally labelled ‘Gotham City’ although from the mock-ups I can’t see why. Minster Court – home to the London Underwriting Centre – has long been nicknamed Gotham City and certainly looks a more likely haunt for Batman and his colleagues than the rather bland new glass and steel development. When the current Lloyd’s building was being built I interviewed the then chief executive of the market, Alan Lord, who was very dismissive of the traditionalist critics of Rogers’ design. He wasn’t an outspoken man and kept his criticism of them rather muted, saying “Whatever else you might think about it, it makes every other building put up in the City since the war look about as imaginative as an igloo”. Of course, building design in the City of London has got a little bolder in recent years but the Lloyd’s building still stands out as a real gem of modern architecture. In his understated way, Alan Lord made an important point that the present powers that be should be sensitive to. By commissioning such a bold and original design, Lloyd’s made a brave statement about imagination and flair. Nearly 30 years later it still stands out and has become one of the landmarks of the City. That confers on Lloyd’s a status that helps it attract business from around the world. In marketing terms it is a godsend as it enables Lloyd’s to portray itself as the hub of the London insurance market, something its market share alone wouldn’t necessarily justify nowadays. By taking a few floors in a massive development it would throw that away. So, when the bean counters look at the bills for running and maintaining the present building someone please tap them on the shoulder and ask them to consider what the value of occupying a separate, distinctive building is to the market, especially as it helps reinforce Lloyd’s image as the home of underwriting flair. They will screw up their faces and mutter about subjective, intangible marketing mumbo-jumbo but these things are important even though they are impossible to include on a balance sheet. I recently put together a video for Lloyd’s on its royal connections and this underlined the status Lloyd’s has in the City of London. The video was to celebrate the visit of the Queen and Prince Philip to Lime Street to celebrate the 325th anniversary of the founding of the market in Edward Lloyd’s coffee house and it included many references to previous royal visits to the market, not least the Queen opening the present building in 1986. Can you imagine the monarch rushing to open a few floors for Lloyd’s in the suggested alternative? No. There is so much Lloyd’s could throw away in an ill-conceived economy drive. « Why do insurance companies find it so hard to engage with their customers?